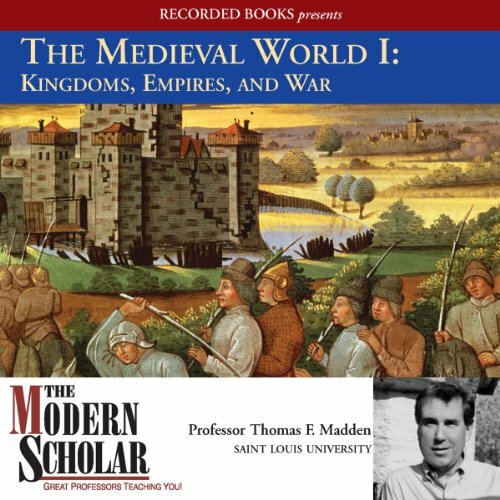 An award-winning, widely recognized expert on premodern history, Professor Thomas F. Madden launches the first of a two-part series on the medieval world. This all-encompassing investigation of a highly influential time period includes the major events of the era and informative discussion of empire, papacy, the Crusades, and the fall of Constantinople. During the course of these lectures, Professor Madden also addresses the rise of Islam, reform movements, and schisms in the church. In so doing, Professor Madden underscores the significance and grand scale of an age that continues to hold an undeniable fascination for people today. There are reasons why I bought just about every lectures given by Thomas F. Madden, if one can forgive his stylistic dullness, his lecture was concise, to the point and informative. The lecture bridges the gap between middle age and high middle age, often 14th century feel too much like a vacume, except 100 year war, it almost feel as if nothing interesting occur after the 4th crusade in 1204 to 1454, if you feel this way, this course would bridge it. Dr. Madden's lectures inspired me to get interested in the medieval world to a degree that I had not anticipated. Extremely interesting topic. I learned so much. How little we know of the peoples, kingdoms and empires that formed the foundation of our society throughout the middle ages. Prof Madden is not at all condescending. This is part 1 of 2 parts- both are excellent and informative and Prof M makes amusing and interesting asides. I've listened to all about 4/5 times. The author ties everything together so well. I like all of Professor Madden's lectures. While this lecture is not a graduate level course by any means, it is a fantastic 200-300 level undergraduate lecture. Dr. Madden is the foremost Crusade historian alive today, and masterfully delivers his extensive knowledge in the Modern Scholar series. Do not listen to those who complain that it's too basic or that he lapses in speech, they're used to gaudy and verbose lectures. True genius is in communicating concisely and exactly, not with a plethora of obtuse and obscure words; take it from a medieval grad student-- less is more/better in academia. Nice overview on the political history of Europe in the Medieval time. Highlights the important turning points, and the events that lead to shape Europe as we know it today. It's a bit difficult to keep up with all the names and people if you're not already familiar with them. Thomas Cahill's histories, gives a lot more background than just dates and actions. Overall it is an eye opener to the fact that what we are taught were the "Dark Ages" were actually a pretty vibrant era of transition. His explanation of the the feudal system and how it developed was particularly insightful. Other reviewers have disparaged the professor's style, I find it very engaging. It is as though he is talking directly to the listener and he sometimes drops in a modern idiom which is delightfully out of place. I'm dumbfounded by the reviewers panning Prof. Madden's speaking style; he's one of my favorites on Audible and I wish he were still recording more! Listen to a sample to decide what camp you are in. He does have a deadpan style, but I find it soothing and dryly funny; sort of the opposite to a Rufus Fears type over-emoting (at least in my book). Substantively, the Middle Ages are fascinating, especially in the hands of someone who can discern what we can know, what we don't know, and the trends in historians' views of the limited source material. If you find this topic interesting, I would highly recommend his courses on the Crusades and on the History of Venice, though I have yet to run across one I didn't like. They are all reminiscent of the best of college lectures. Madden at his scholarly best. I've listened to a dozen courses from Professor Madden, and this is right up there among my favorites. His style is very informal, with a great narrative flow and lots of fascinating asides along the way. The course itself has a very broad scope, so if you are looking for general knowledge or just want to brush up on the period, you won't be disappointed. Highly recommended! This seems to be aimed at the home-school middle school market. He's clearly avoiding any big words and complex concepts. A good way to learn some basic names and stories of medieval history. The focus is very much on the popes, England, and France. Anyone hoping to learn about Spain or Eastern Europe will be out of luck. I was happily surprised that at least some attention is given to Late Antiquity (the Byzantine Empire). Excellent introduction to the period. What did you like most about The Modern Scholar? The story is told with accuracy and passion. The reader is lead along to understand the developing period through narrative. As a History, characters come and go, and while there are thumbnail sketches of individuals, the sweep of the period lets you understand that this is not a story of the lives of great men, but a more considered evaluation of the times. The natural medium of this text is aural : they are in effect lectures given to a small tutorial. While it would be possible simply to read the text, the nuance of the voice allows you to pick up on connection and inter connections. The lectures are designed more to awaken the mind that excite the emotions.However it does make you think of past decisions that appear to have unexpected results. O tempera ! O Mores ! I can thoroughly recommend this lecture series as a good place to start with understanding the medieval period. I have listened to several Thomas F.Madden's books. Although they are mostly built as lectures, they are easy to listen and follow. Good source of information whether for a student or just someone who is interested in the respective time period of our history, like me. The Medieval World series cover various areas and are very well presented and informative. Read by the author himself. Might take some time to get used to his voice and rather lecture like presentation style. Listened with delight and attraction. Suggest for widening the history knowledge and understanding. I'm a great fan of the Modern Scholar series, and like most of them the content here was excellent. Unlike some of them, this is presented in a very listenable way. A joy to listen to.